The BPM (beats per minute) of a song isn't something you can easily calculate despite the number of online programs available. 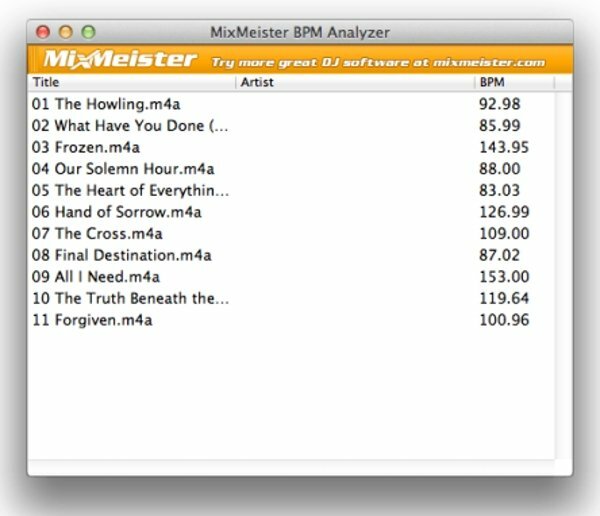 However, thanks to the program BPM Analyzer we can find out that data about any song in just a few seconds. How it works is very easy: just load the folder containing the music to be analyzed and that's it. Determinte the exact BPM of any song. Neither iTunes or Audacity are capable of analyzing with precision the number of beats per minute of an audio file. But this program comes along with a really easy-to-use interface, allowing you to drag and drop files, and offers you the possibility to update file tags with the correct BPM data. You can even print reports about the BPM of your music files or export the information obtained to an Excel table, which other alternative online programs don't allow you to. How to use BPM Analyzer? This software analyzes the beats per minute of any song compressed in MP3 format. Using it is very simple, just drag the songs you want to analyze to the interface and wait for the results to be offered. If you're a music fan or even a DJ, this program is definitely for you as knowing the BPM of a song can simplify your work when it comes to speeding or slowing down tracks to mix them. Thanks to this program, you can choose the best programs to be mixed together or create playlists at the appropriate rhythm, depending on what you fancy.